The just concluded winter session of Parliament will be remembered for many landmark bills that were introduced in the house by the government and discussed in the house with flowing zeal and passion. Many such bills became law. The most illustrious among them, in terms of its importance and future consequences, was the legislation to provide ten per cent reservation to the economically weaker sections of society in government jobs and education. It was a promise made by many political parties, but never fulfilled. The Modi government proved that when it comes to fulfilling promises and meeting the true ends of social justice, action requires a little more than mere lip service. Many important bills failed to make the cut—the prominent among them were the Triple Talaq Bill and the Citizenship (Amendment) Bill, 2016. The latter being one of the most misunderstood and misinterpreted bills in recent times. Hence, it is important to understand what this bill intends to achieve and why it is not against Assam. 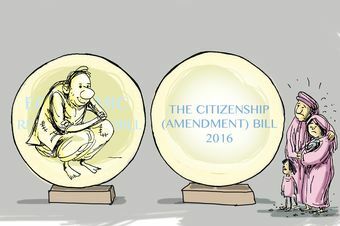 The Citizenship (Amendment) Bill, 2016, intends to award permanent citizenship to those Hindus, Buddhists, Sikhs, Jains, Christians and Parsis who fled to India before December 31, 2014, as a result of religious persecution in Bangladesh, Pakistan and Afghanistan. The bill proposes to grant citizenship on the basis of a detailed evaluation and validation report from the district and state authorities. It is a fact that these three neighbours of India have had a long history of religious persecution in which the six mentioned communities have suffered the most. The migrant refugees from Bangladesh have mostly settled in Assam, West Bengal, Meghalaya and Tripura. Similarly, refugees from Afghanistan and Pakistan have mostly settled in Rajasthan, Punjab, Gujarat and Delhi. A humanitarian refugee policy to deal with such specific forms of migration was the need of the hour. Such a need had always been under discussion since the days of B.R. Ambedkar and Jawaharlal Nehru, and it continued even during the UPA governments, but could not take shape. Hence, the Modi government took up a task which was a historical requirement. The bill tries to identify and specify differences between illegal and economic migrants, and religiously-persecuted refugees. It aims to grant citizenship to the latter by reducing the normal requirements of residentship from 12 years to seven years. Further, it aims to prohibit illegal migration of Bangladeshis, mostly Muslims, who infiltrate into India under the garb of better economic opportunities. But the reality is contrary to this, as the economic activities and prosperity in Assam and adjoining areas is no better than Bangladesh. The bill has raised concerns among some sections of people in Assam who fear that the bill, if enacted into a law, would change the demography of Assam by legalising influx of Hindus and other minorities from Bangladesh. Second, it is apprehended that such an action would negate the Assam Accord of 1985 which talked of identifying all settlers from Bangladesh, who entered into Assam after March 24, 1971, through preparing a NRC (National Register of Citizens) and to deport them as illegal migrants. However, such an apprehension is based upon fictitious presumptions. First of all, such a refugee with citizenship rights will not necessarily settle in Assam only. Rather, giving citizenship to such people would facilitate their movement to other parts of the country which offer better opportunities, as they need no longer fear prosecution. Further, the government is fully committed in protecting the social, cultural and linguistic identities of the Assamese people through the “constitutional, legislative and administrative safeguards” mentioned in Clause 6 of the Assam Accord. For this, the Central government has already constituted a high-level panel that would look into various measures to ensure it, including giving reservations for the people of Assam in government employment.